Techjoomla is pleased to announce our new partnership with JoomlaShine to bring JTicketing users a beautiful treat! JSN Festival, their latest offering brings a stunning new user interface for JTicketing. This template is a perfect fit for any ticketing system. JoomlaShine is one of the leading template providers for Joomla and produces easy to install high-quality templates. 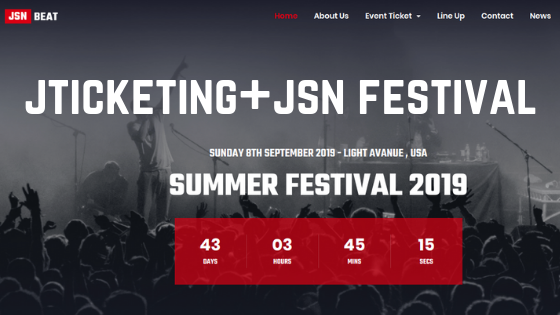 We have worked with the JoomlaShine team to make sure JTicketing looks great with the JSN Festival template. We had earlier worked with the JoomlaShine team for the JSN Fidem template for JGive. If you are currently using JTicketing or planning to use JTicketing, this is one template that definitely deserves your attention. The smooth and simple template works perfectly with multiple layout types and the back-end interface enables user customization. This Joomla! template is built with JSN PageBuilder 3. It is presented in two different niches-Beat and Festival. The different JTicketing views, modules and features like activity stream, image gallery, calendar, etc are very nicely presented using the sleek template design. Our customers can get a special 20% discount on JoomlaShine products. Login and view the partners' page to view the coupon code and grab the fantastic discount. Get rid of boring, plain email confirmation emails with the JSN Festival email template. Similar to the ticket template, it’s super easy to customize and comes with 5 different pre-built layouts that you can choose from.